Dr. Kevin Livingston examines the story of Bartimaeus who put his faith in Jesus and received his sight. Dr. Livingston discusses the implications of such an act and how we can follow this example. 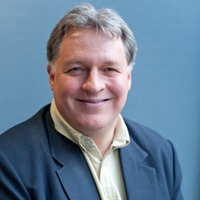 Dr. Livingston is an ordained minister of the Presbyterian Church in Canada and has served congregations in Seattle, Scotland, Vancouver, Cambridge, and most recently, the historic Knox Presbyterian Church in Toronto. Passionate about the integration of pastoral ministry and theological education, he previously served as adjunct professor at McMaster Divinity College and Tyndale Seminary. He is committed to scholarship in the service of the church and has contributed to a Festshcrift for David Bosch, Mission in Creative Tension, edited by W. A. Saayman and J. N. J. Kritzinger (South African Missiological Society, 1990) and has published articles in the International Bulletin of Missionary Research, Missionalia and Channels. His research interests are in the ministry of preaching and the renewal of the church. Dr. Livingston serves on the Board of Directors of the Latin America Mission and several committees of the Presbyterian Church in Canada.